As European leader of specialised medical pathology, Eurofins Biomnis relies on both specialised and multidisciplinary professions. We are constantly seeking motivated and exceptional individuals who will always work in the best interests of our clients and patients. It is the role of the consultant pathologist to ensure that tests in one or several disciplines are carried out correctly and to be available for consultation to our reference laboratories and physicians. In addition, they actively participate in the scientific communication for the laboratory through attending and presenting at national and international conferences. As well as being certified Medical Doctors or Pharmacists, the pathologists at Eurofins Biomnis are proactive and have excellent people skills which allows them to work with a wide variety of stakeholders. Our pathologists are all experts in their chosen fields. The Biomedical Scientists at Eurofins Biomnis organise and manage projects within their specialities. They participate in the development of new technologies and new applications. As qualified engineers or phDs and gifted with an intellectual and scientific curiousity, the biomedical scientists are genuine pillars of skill and know-how in their field of activity. 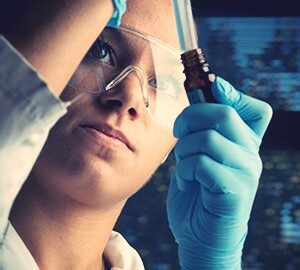 The Laboratory technologists carry out medical testing using manual and/or automated methods to bring a viable result to the pathologist and to the patients. This role requires organisation, rigour and teamwork. Laboratory technologists must have a good scientific background accompanied by a great curiosity for learning. At Eurofins Biomnis, they have the possibility of discovering highly specialised methods which are quite uncommon in routine biology. The medical secretaries respond to customer queries by telephone and respond immediately to all requests. They ensure optimal follow-up of all patient medical files. They are reactive, can adapt to any environment and have excellent listening skills and a good sense of diplomacy. Registration agents ensure the safe and secure reception, unpacking, sorting and registration of patient files and are responsible for the dispatch of samples to the different technical departments. This role requires methodology, concentration and rigour. Technical support and roles of assistance regroups all of the other functions of the company which are required for laboratory and operational assistance. As a whole, these roles require solid technical skills (IT, Quality, EH &S, HR, Communication, Accountancy, Legal, Maintenance). They also require proactive approaches to improve the performance of the laboratory as well as excellent interpersonal skills to persuade, convince, initiate and accompany change. Hello, I invite you to consult the site www.biomnis.com, on page Our jobs https://www.eurofins-biomnis.com/en/biomnis/career/our-jobs/ Best regards.